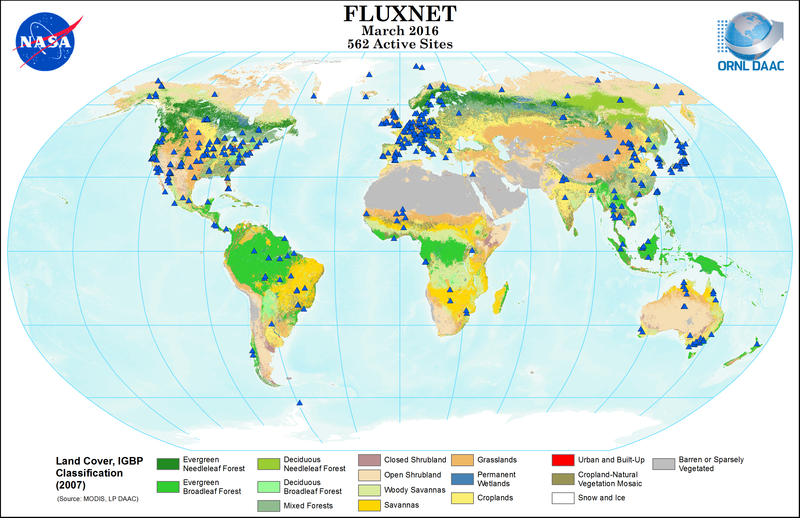 FLUXNET is a global network of micrometeorological tower sites that use eddy covariance methods to measure the exchanges of carbon dioxide, water vapor, and energy between terrestrial ecosystems and the atmosphere. This dataset provides information from the ORNL DAAC-hosted FLUXNET site database which was discontinued in 2016. The files provided contain a list of investigators associated with each tower site, site locations and environmental data, and a bibliography of papers that used FLUXNET data. For more up to date information on FLUXNET sites, see http://fluxnet.fluxdata.org/. There are nine data files with this dataset. This includes one compressed shapefile (.zip) with the locations of the sites, one compressed directory (.tar.gz) containing site data sheets, and seven comma-separated files (.csv) which provide the site locations, FLUXNET identifiers, investigator information, and bibliography. Related Dataset: The following dataset contains an archived copy of the ORNL DAAC's Fluxnet Website as of September 2017. It provides much of the same information contained in this dataset. There are nine data files with this dataset. This includes one compressed shapefile (.zip) with the locations of the sites, one compressed directory (.tar.gz) containing site data sheets, and seven comma-separated files (.csv). Sixteen companion files, including the shapefile data in .kmz (Google Earth) format, are also provided. Table 1. Data file names and descriptions. fluxnet_mapbooks.tar.gz Compressed directory containing 1,407 site data sheets in .png format. The data sheets provide location maps and overview of environmental conditions at each fluxnet site. The shapefile (.shp) is provided in fluxnet_sites.zip. The following information is provided in the file. There are seven comma-separated files (.csv) included in this dataset. Each file and its contents are listed below. This file provides contact information pertaining to the FLUXNET investigators and their affiliated FLUXNET site IDs. Table 7. Contents of the file fluxnet_calculated_data.csv. Climate and other ancillary data for each site was gathered from various sources and used to create Figure 2 and several other plots included as companion files. 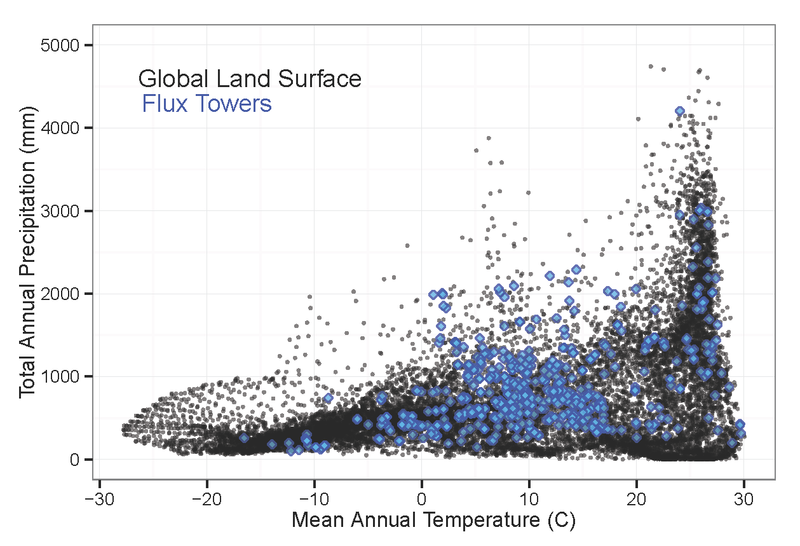 Figure 2: Calculated mean annual temperature and total annual precipitation for all active Fluxnet sites (blue diamonds; as of March 2016) as compared to the climatic regimes of one-degree grid cells for the Earth's land surface area. This image is included as a companion file: fluxnet_Climate.png. Table 8. The file fluxnet_bibliography_20160729.csv contains a list of publications that used FLUXNET program data. Each paper is associated with one or more sites. When uncompressed, this file contains 1,407 site data sheets in .png format showing a variety of environmental conditions at each fluxnet site. The individual files are named by the fluxnet site ID. See Fig 3 for an example. Figure 3: An example of the site data sheets, or mapbooks, provided for each site. 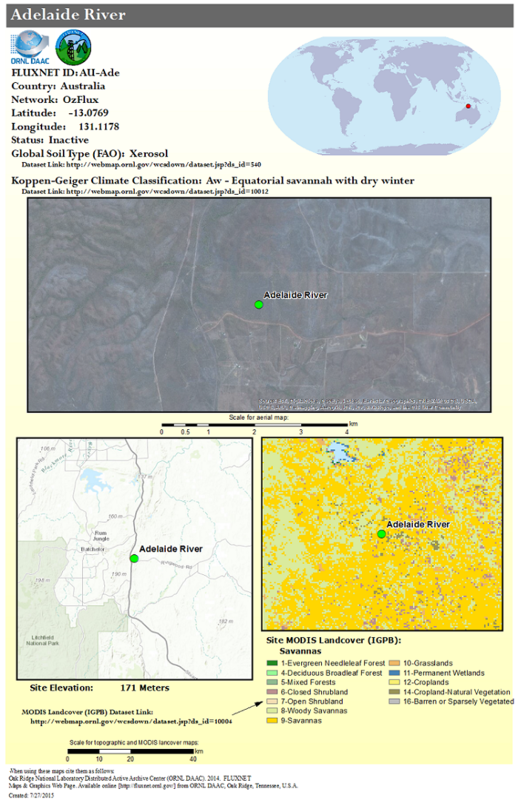 This data sheet shows climate, land cover, and topography for the Adelaide River site (ID 2856) in Australia. Table 9. There are 16 companion files provided and each is described below. fluxnet_Climate.png Calculated mean annual temperature and total annual precipitation for all active Fluxnet sites (blue diamonds; as of March 2016) as compared to the climatic regimes of one-degree grid cells for the Earth's land surface area. Figure 2 above. The FLUXNET site database is useful for understanding the historical coverage of flux towers globally and as a resource for related publications. These data are provided with no guarantee of accuracy. Data in fluxnet_calculated_data.csv are especially subject to error. This data has not been maintained or updated since March 2016. For the most up to date information, see the Fluxnet project database at http://fluxnet.fluxdata.org/ .